These ice grippers make walking on snow and ice safer. 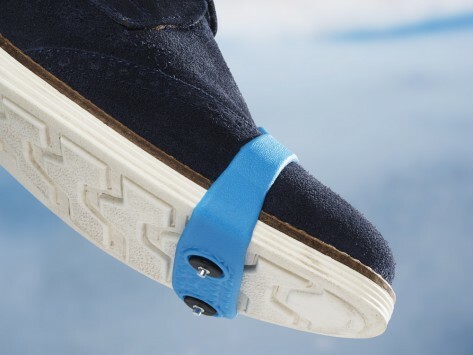 Suitable for adults as well as teenagers and older children, Nordic Grip Minis are ideal to wear in any snowy or icy conditions. They pull on to the toe box of all types of footwear: formal shoes, sneakers, boots, high heels, and rain boots. Dimensions (each): 3.5" x 1" x 0.25"
Stretches to a width of 4" and height of 2"
Stretches to a width of 5" and height of 3"
They make going up and down my husbands wheelchair ramp in icy weather a lot safer. Nice product. Work well at least for short distances. Easier for me to put on than whole shoe type. I have arthritis and these go on easy. Gift for parent! Great! Ordering a pair for myself! When the forecast calls for hats, gloves, and scarves, it’s time to break out the Nordic Grips. All the way from Norway comes a smart little problem solver for icy conditions. Designed to fit right over your favorite pair of shoes, Nordic Grips help prevent you from slipping without compromising your style. Available in a variety of colors, Nordic Grips are an easy, affordable, fashion-friendly way to add security to every step. Each pair even comes in a convenient carrying case compact enough to tuck in your pocket or purse when not in use. No bulk. No worries. No wonder people of all ages are stepping out in Nordic Grips.